Lordsville preacher Serenity Johnson is literally blinded by greed, while Caine locates his paternal grandfather, who has lived a bitter life blinded by prejudice. Caine becomes a Barbary Coast prizefighter in an effort to locate his brother before he's killed. Kwai Chang Caine meets up with the father of the man he killed in China who seeks revenge using Caine's own illegitimate son. Just finished watching disc 1. This show still holds up today. OK more modern technology would make the shots appear better but the story, acting, editing...all awesome. I loved this series it was a major influence in my life as a child. I can't wait to finish the rest of Season 1. The "Extras" on the disc are sort of lame. I guess if you never saw the show or aren't really a fan then they serve a purpose but I know all this stuff already. I'd love to have a version with running commentary from David Carradine underneath. Carradine has allegedly been requesting more interesting "extras" for the season 2 disc like a taped dinner party of some key participants and others speaking to how the series influenced their lives, like Tarintino and his Kill Bill films. 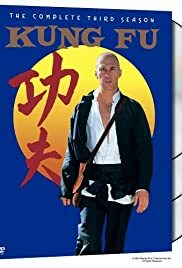 I adore David Carradine as an actor I'd listen to him talk about just about anything. So when is Season 2 released?